Issa defends Internet freedom | UTSanDiego.com: ""Stick it to the man," said Issa, (US Congressman Darrell Issa) chairman of the House Oversight Committee, adding access to information is a "human right." 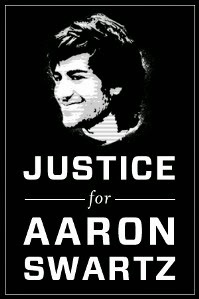 Swartz took his own life last month as he faced multiple felony charges for allegedly hacking into Massachusetts Institute of Technology computers and downloading reams of scholarly articles he sought to make free to the world. Justice Department officials have agreed to brief Issa and other committee members about why the department originally charged the 26-year-old Swartz with four felony crimes and later upgraded it to 13 counts. Issa called that an overreaction and vowed that he and congressional colleagues will establish restraints on what he called an abuse of prosecutorial discretion. Swartz faced as much as 50 years in prison and $1 million in fines had he gone to trial as scheduled in April and been convicted. . . . "